Belgian winger Yannick Ferreira Carrasco arrived at Atletico Madrid from AS Monaco in the summer as a replacement for the outgoing Arda Turan, but he had to bide his time before making an impact for his new club. It was late September before he managed his first start in La Liga, and he was subbed off there at half-time, leading to premature worries he might not be fitting in as required. But those fears were soon swept aside with a series of inventive, fast-paced performances with impressive end product, both as starter and impact sub. Carrasco has quickly become an important player for Atleti on account of his differentiation from the other players in the squad—a pivotal part of the attack who will have a big impact over the course of the season as the club challenge for major honours. In Diego Simeone's preferred 4-4-2 system, Carrasco has already played on both sides of midfield. Indeed, his main role when starting is to begin on one flank—typically the right—and then soon swap over to the opposite side. From either flank, but particularly left, he is able to cut infield with the ball at his feet and make use of the space in front of the opposition defence. He could also play centrally on the occasions Simeone opts to switch to a 4-2-3-1, as he did at times last season. This term, the alternative has been 4-3-3, meaning there is no need for a No. 10 link player. Carrasco has shown in recent weeks, though, that he understands what the manager wants; his willingness to press and challenge in midfield is key, before his own technical traits take over once Atleti have possession. And here's why Carrasco has quickly become integral to Atletico: His technical and physical traits are extremely different to that offered by his team-mates. Koke, Gabi and Tiago are relentless in their work rate, can all pass the ball well and can do both defensive and offensive jobs. Oliver Torres is skilful, can find and use space extremely well and can play incisive passes into the front line...but it is Carrasco who has the lightning burst of acceleration which can open up teams. When Atleti win possession in midfield in particular, Carrasco's ability to surge forward makes him the obvious go-to option for the team to switch play to and look to support quickly, while his one-on-one talents means he can pull defences open by running at or around his marker. On the counter-attack, Carrasco's pace is even more important: Atletico tend to sit extremely deep and defend for long stretches this season when they feel it prudent, especially when defending a lead in the second half. Along with Griezmann, Carrasco is really the only other outlet who can help the team break out from this structure and carry the ball a large distance very quickly. It's not just putting the ball in the net either, but also creating: Carrasco's movement and dribbling opens spaces for others, and if he doesn't shoot at the end of his runs, he's capable of picking a clever pass at the end. The Belgian winger reminds of a gazelle not only for his long, slicked back hair, but his abounding pace and fleet of foot. Like a Gazelle, he is elegant but his lean frame isn’t exactly imposing. The Vicente Calderon is the perfect place for him to develop the physical side of his game and for Atletico, he adds a touch of quality to help strengthen the team’s shift from a counter-attacking, defensive-oriented team to a more complete, high-pressing unit. In this way, they are the perfect fit for each other. It was at Monaco where he developed this versatility that underlies his game. Carrasco grew up in Belgium and moved to Monaco in 2010 from Genk. After spending two years with their reserves, the winger established himself as a starter as Monaco tore through France’s second division. Upon promotion, the club signed the likes of Joao Moutinho and James Rodriguez, sidelining Carrasco in the 2013/2014 season. Yet he broke onto the scene again last year, bagging three goals and making six assists from a wide position, including a game-winning goal against Arsenal in the Champions League. Although he occasionally suffers defensive lapses, Carrasco offers a stubborn mentality that not many players of his skill-set have and Simeone will undoubtedly strengthen his defensive game. Carrasco has won four caps for Belgium and it was international teammate Thibaut Courtois who helped convince the twenty-two-year-old to join Atletico. 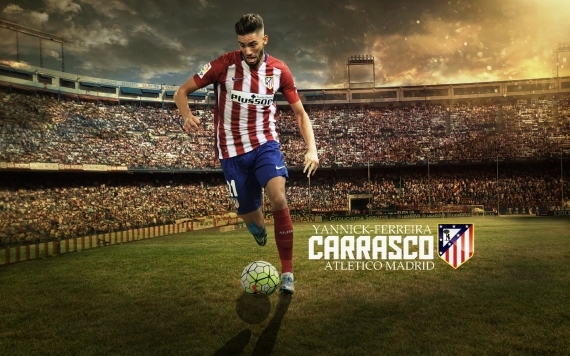 Perhaps sooner than he expected, Carrasco has folded into Atletico’s new-look team. He has adapted to the La Liga extremely well thanks to his tremendous versatility. The team needs balance, work rate and huge mental strength to cope with Simeone's demands, but in terms of a match-winner, Carrasco's unique traits within the squad will make him one of the keys for Atleti.